“Blessed are those You choose and bring near to live in Your courts!” Psalm 65:4 NIV. Where you live matters. I am not referring to the geographical part of the world where you live, nor the country, state, county, city, or neighborhood that you call home. Where do you feel most at home? Where do you know you are safe and loved? Where do you know others, and are also known by them? In David’s writings, he references where he wishes always to dwell, a place beyond the simple sheepfold of a shepherd, the dangerous battlefields of a warrior, the humble caves of a fugitive, or the elaborate palace of Israel’s king. But if you read his writings, David refers to a presence more than a place. “One thing I have asked of the Lord, that I shall seek: that I may dwell in the house of the Lord all the days of my life to behold the beauty of the Lord and to meditate in His Temple.” Psalm 27:4 NAS. Similarly, David expresses his desire and confidence, “Surely goodness and mercy shall follow me all the days of my life and I shall dwell in the house of the Lord forever.” Psalm 23:6 NAS. David longed to be ever in the presence of His God during his lifetime and throughout eternity. And David understood that wonderful presence he desired is by God’s initiative as well as invitation. “How blessed is the one You choose and bring near to You to dwell in Your courts. We will be satisfied with the goodness of Your house, Your holy temple.” Psalm 65:4 NAS. Be assured, the Savior’s invitation is indiscriminate of your history, good or bad. His invitation is founded on His righteousness, not yours. He chooses whoever responds to His initiative. “You did not choose me, but I chose you . .” John 15:16 NIV. The Gospel is simple. God’s invitation. Your destiny. Christ’s sacrifice. Your determination. “Whoever calls on the name of the Lord shall be saved.” Rom 10:13 NKJV. “Whoever confesses that Jesus is the Son of God, God abides in Him, and he in God.” 1 John 4:15 NKJV. The final message of the Bible is, “Let the thirsty ones come – anyone who wants to. Let them come and drink the water of life without charge.” Revelation 22:17 NLT. God’s will is clear and unchanging. God’s grace awaits your gracious response. 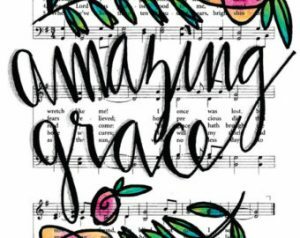 Grace is best understood when defined as, “receiving what you could not deserve and not receiving what you did.” No wonder they describe God’s grace as, “amazing.” Paul well understood his own history and the profound grace of God given to him. “At one time, we too were foolish, disobedient, deceived and enslaved by all kinds of passions and pleasures. But when the kindness and love of God our Savior appeared, He saved us, not because of righteous things we had done, but because of His mercy. So that, having been justified by His grace, we might become heirs having the hope of eternal life.” Read Titus 3:3-8 NIV. See Romans 5:1-2 NIV and 2 Timothy 1:9 NKJV. What is your proper response? Thanksgiving and praise open the Heavens. Your fitting entrance into His presence is with extravagant thanksgiving for what Christ has done and exuberant praise for Who God is. “Enter His gates with thanksgiving and His courts with praise; give thanks to Him and praise His name. For the Lord is good and His love endures forever; His faithfulness continues through all generations.” Psalm 100:4-5 NIV. Christ is worthy. God is righteous. Today, I pray for you to cherish God’s presence with you more than all other desires. My fourth-grade teacher taught me an appreciation and respect for words. My Dad taught me the responsibility of words. Words were important to my Dad. I recall his reminding me, “Allen, never speak words you don’t mean.” That seems plain and simple enough. He practiced and believed that your words represent you and your good name, and insisted they be honest and honorable always and to all. If not already, you will learn that not all people mean what they say, say what they mean, or do what they say. That is unfortunate, but never let that be said of you. Words are the essential currency of social interactions. Words are the necessary tool for ordinary communication, meaningful exchange of ideas, and the intended covenant of business and agreement. I have visited and ministered in countries where their native language is different from mine. Thankfully, I was accompanied by others who made me understood and helped me understand. Words contain life and carry the seeds of creation. “In the beginning was the Word, and the Word was with God, and the Word was God. He was with God in the beginning. Through Him all things were made; without Him nothing was made that has been made.” John 1:1-3 NIV. The Creator spoke, and it was so. “We understand that the universe was created by God’s word.” Hebrews 11:3 TEV. Words have the power to heal or hurt, inspire or intimidate, inform or deceive, build or tear down. Solomon warned, “You must live with the consequences of everything you say. What you say can preserve life or destroy it; so you must accept the consequences of your words.” Proverbs 18:20-21 TEV. Your words are important to God. 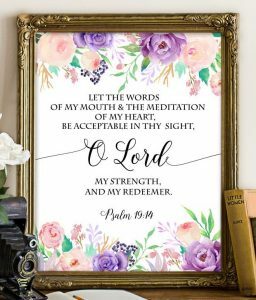 “May the words of my mouth and the meditation of my heart be pleasing in your sight, O Lord.” Psalm 19:14 NIV. In unguarded moments and situations, your words will eventually reflect your true attitudes and thoughts. Know your heart. Guard your words. Paul urged that your words should not be, “foolish talk or coarse jokes.” Read Ephesians 5:3-4 NLT. Jesus’ words are sobering, “For out of the overflow of the heart the mouth speaks . . But I tell you that men will have to give account on the day of judgment for every careless word they have spoken.” Read Matthew 12:35-37 NIV. Your words must be important to you. “Let your speech be always with grace, as though seasoned with salt, so you will know how you should respond to each person.” Colossians 4:6. In those words, I see the picture of a mom carefully preparing supper for her family, tasting and seasoning as she cooks. Taste your words before you lend them a voice. Just in case you must eat them later. “Words from a wise man’s mouth are gracious . . A man of knowledge uses words with restraint.” Ecclesiastes 10:12/Proverbs 17:27 NIV. Today, I pray for you to choose your words to be gentle and loving without need for regret. Every person has many needs. None is stronger or more essential than your need to be and feel loved. The greatest gift of one’s self is to offer love to another flawed person, not because of anything they have or have not done, but simply because you chose to love them. Love sets an elevated value on another person higher than they may have thought themselves deserving. And that’s a great feeling for both the one loving and the one loved. Why do people struggle to believe they can be loved? On some occasion, every person has felt rejection or being unwanted. Hurting people hurt people. That is unfortunate but probably unavoidable in an unkind and hurting world. Such feelings diminish your understanding of self-worth and may wrongly persuade you that you are unlovely, or even unlovable. Those emotions are difficult to change, even when told otherwise. I heard it said, “Your actions speak so loudly that I cannot hear a word you are saying.” That is nowhere more true than in this matter of love. Love is most persuasive when evidenced by grace given and behavior observed, rather than by mere words that proclaim love. Love is volitional, before it becomes emotional. In every action and overture toward you, God is unchangeably consistent with His choice to love you forever. 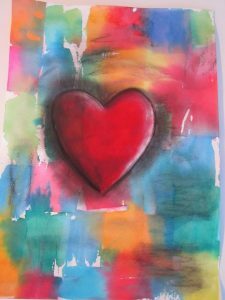 When teaching on love years earlier, the Lord gave an insight expressed in this understanding, To be authentic, love must be practical and observable. God’s love for you is practical, observable, and always sacrificial. “For God loved the world so much that He gave His only Son, so that everyone who believes in Him may not die but have eternal life.” John 3:16 TEV. The love of God is practical enough to provide, protect, and preserve, and is plainly observable in the wonderful plans He has made for you, forever. God said, “I know the plans I have for you . . to give you hope and a future.” Jeremiah 29:11 NIV. God chose to love you extravagantly and eternally, without measure or requirement. Being loved embraces the obligation to love others in no lesser way. “This is what love is: it is not that we have loved God, but that He loved us and sent His Son to be the means by which our sins are forgiven. Dear friends, if this is how God loved us, then we should love one another.” 1 John 4:10-11 TEV. You are loved; be loving. See Ephesians 3:17-20 NIV. In life, I have found that loving is well worth the risk, and the rewards are the incredible, extravagant dimensions of Christ’s own love. “Take in . . the extravagant dimensions of Christ’s love.” Ephesians 3:18 MSG. See Romans 8:35-39 NAS. Your love is limited until you embrace His love without limits. Today, I pray for you to receive the immeasurable love of God and share it generously. Being tired is tiresome. Tiredness seems more pandemic than at any time I recall. In today’s high stress and success driven society, burnout is an undeniable fact. If all weariness was only physical tiredness, a nap or a good night’s rest would be a remedy. Exertion is not the only cause of exhaustion. And rest is not always the solution. Feelings of exhaustion can come from less obvious sources also. Mental tiredness may result from too many demands on your thought or attention. Anxiety is tiring, producing emotional tiredness. Worry is exhausting, as is fearfulness. Spiritual weariness from a restless soul is even worse. Disobedience is draining. “Anyone, then, who knows the good he ought to do and doesn’t do it, sins.” James 4:17. Sin is debilitating, even self-destructive. Just as busyness is not always productive, idleness does not cure tiredness. A person soon tires of doing nothing. You were not created to only work, nor to remain idle. Life has a rhythm – work and rest, activity and inactivity, productivity and replenishment. At creation, God Himself modeled the helpful and healthful rhythm of work and rest. “By the seventh day God had finished the work He had been doing; so on the seventh day He rested from all his work. And God blessed the seventh day and made it holy, because on it He rested from all the work of creating that He had done.” Genesis 2:2-3 NIV. Those are not exactly equal parts, but they certainly are equally important parts. Discover that rhythm and you will have all the strength and energy that you need. Ignore that balance and life doesn’t work as well for you, no matter how much you want or need it to do so. “Then, because so many people were coming and going that they did not even have a chance to eat, Jesus said to them, ‘Come with Me to a quiet place and get some rest.’” Mark 6:31 NIV. Even though they were involved in good things, that was not enough to make it good for them. Do you ever identify with what the disciples must have felt? I heard a person announce, “I am sick and tired of being sick and tired.” If that could be you, life will only change for you when you finally tire of being tired; only then will you make the necessary adjustments for that to change. David, the Shepherd and Psalmist had it right; “[The Lord] makes me to lie down in green pastures; He leads me beside the still waters. He restores my soul.” Psalm 23:2-3 NKJV. When you most feel like you cannot afford to take time off is often the time you cannot afford not to do so. Rest is wise when you are weary, indicating neither weakness nor a waste of time. The price that is exacted from marriages, personal relationships, quality of life, and spiritual fulfillment is inestimable. Don’t be a statistic. “Casting all your care upon Him, for He cares for you.” 1 Peter 5:7 NKJV. I think you can trust the Creator to know what works best with His creation. 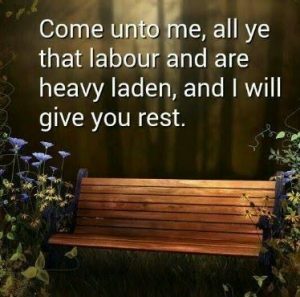 “Then Jesus said, ‘Come to me, all of you who are weary and carry heavy burdens, and I will give you rest. Take My yoke upon you. Let Me teach you, because I am humble and gentle, and you will find rest for your souls. For My yoke fits perfectly, and the burden I give you is light.’” Matt 11:28-30 NLT. Today, I pray for you to do God’s work God’s way so you will have God’s blessing. “If we confess our sins, He is faithful and just and will forgive us our sins.” 1 John 1:9 NIV. As a young teen, more than once I was reminded by my Dad, “You may be sure your sins will find you out.” Numbers 32:23 NIV. I never felt his words threatening, nor did my Dad mean them to be. He wanted me to understand the folly of sin; he succeeded in doing that. I was sobered by his words and probably behaved better than I might have otherwise. When you live everyday life with a deep conviction of the holiness of God and the inherent sinfulness of your own flesh, you will subject your decisions and plans to a more careful scrutiny. Doing so is a healthy and spiritually beneficial exercise. Sin will not stay a secret for long. The harder you run from facing your wrongs the faster truth pursues you. Covering what you have done never succeeds. Why even try? Denial doesn’t make your wrong disappear. Jesus warned, “Beware of hypocrisy. The time is coming when everything will be revealed; all that is secret will be made public. Whatever you have . . whispered behind closed doors will be shouted from the housetops for all to hear.” Luke 12:1-3 NLT. Eventually, wrong is exposed. Ever wondered why? The enemy of your soul wants your transgression to become a permanent and fatal flaw, so he tempts you to deny and hide it. Doing so never works out well for anyone but your spiritual adversary. The devil wants to torture you with your wrong doing and allow him to eventually rule over you. If the accuser of your soul can succeed, he can keep you in the prison of your own guilt and shame. The Bible describes him as, “The accuser of our brothers, who accuses them before our God day and night.” Read Revelation 12:10-11 NIV. His scheme is to control you by the threat of exposure. Never give him that leverage. How much more plain could anything be? Adam and Eve tried blaming, denying, and hiding in the Garden of Eden. How did that work out for them? Read Genesis 3:6-13 NIV. God will not let that work for you any better than it did for Adam and Eve. God loves you too much to allow that to happen. Because of His love, God will not allow the strategy of denying and hiding sin to succeed. “He who conceals his sins does not prosper, but whoever confesses and renounces them finds mercy.” Proverbs 28:13 NIV. What then is the righteous response to sin? 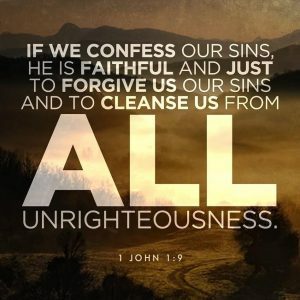 My dearest of friends, Campbell, often said, “There is only one way that sin leaves a life – through the mouth in confession.” “If we confess our sins, He is faithful and just and will forgive us our sins and purify us from all unrighteousness.” Read 1 John 1:5-10 NIV. Honest and humble repentance before God and man is the only cure for sin. David wrote, “When I acknowledged my sin to You and did not cover up my iniquity. I said, ‘I will confess my transgressions to the Lord’ – and You forgave the guilt of my sin.” Read Psalm 32:1-5 NIV. Today, I pray for you to know that honesty about sin is always the best policy.